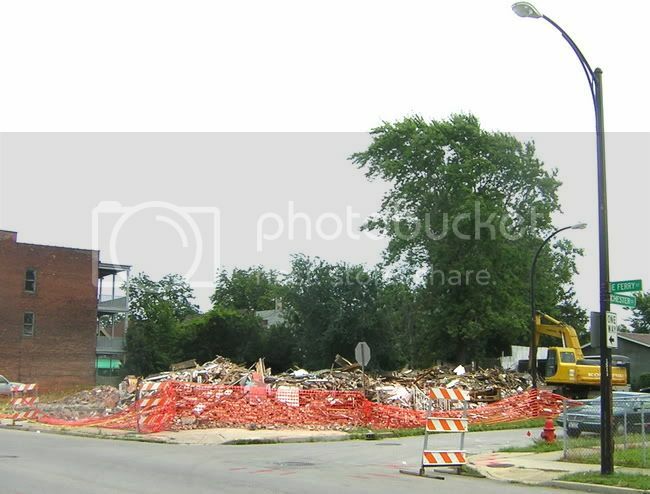 The 15th building I've identified as a public health risk - within a two/three block area around the future home of Performing Arts High School - came crashing down on Friday afternoon. 153 East Ferry has been vacant at least ten years and would have come crumbling down on its own in a few weeks, maybe months. The roof had collapsed two years ago and side walk barricades have been up and falling down for the past three years. I'll check with Housing Court to see what the demolition arrangements were. 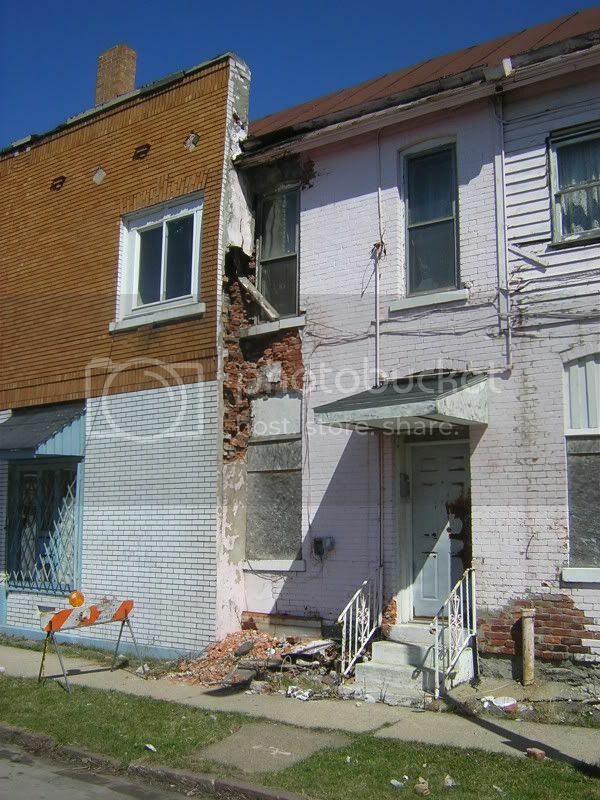 The owner has not maintained the builidng over the last 10 years and I've called it out to the Inspections Dept. numerous times in the last few years. It was a unique building for sure with the curved corner entrance. It reminded me of a number of places on Elmwood that started out as houses and were transformed into mixed use commercial spaces. This is a meticulously maintained two family house. It's been owner occupied and is now available for $19,900 - it's directly across the street from future home of Performing Arts High School. It's a 3/3 double and is surrounded by two houses that are on my demo-list! The rear yard is fenced in and the senior who just moved out has kept this house in perfect condition. 1400 sq. feet up and down! Full attic and basement. Clean...nothing fancy or architecturally redeeming about the place...solid! This won't last. It's as close to being perfect as you can get. If you are looking for an affordable home - $19,900 - or an excellent rental, this won't last long! E-mail me for addtional details or a neighborhood tour. Call the international bank of mom & dad if you have to...When the school is complete and a few more houses are wasted...you'll be able to double your money on this one in five years. btw...if you plan to slum this place, don't bother. I'll be up and down and all over your case! Promise. 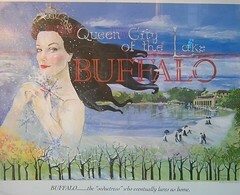 Weekly pictures here and of your other Buffalo properties, too! Consider yourself warned! update...8/2/06...just heard that this house sold! List to sell, less than three weeks! 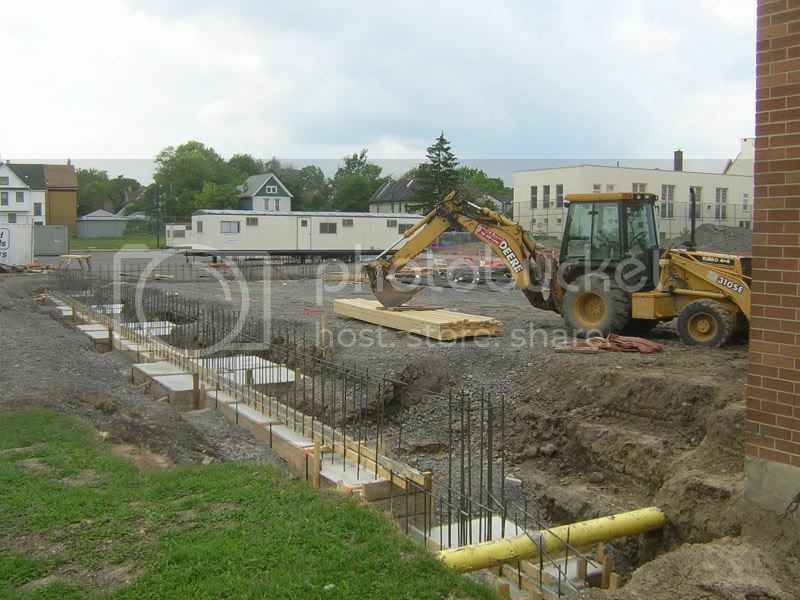 The photos clearly show last week's intitial progress on two of three foundations for the buildings new additions. On the left is a familiar perspective looking west on Ferry Street. 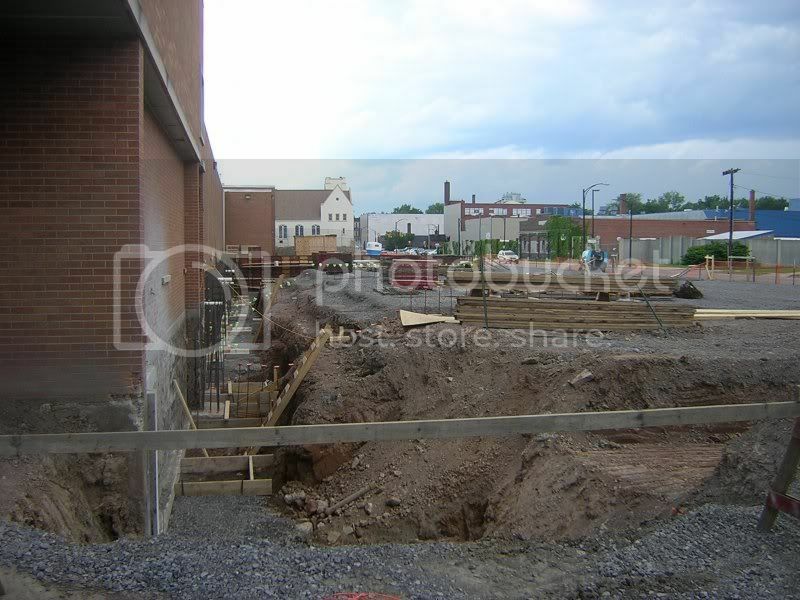 This will be the new 'performance entrance' to the Performing Arts building. On the West side of the building and directly across the street from my home, you can see the beginnings of the new two story art wing. 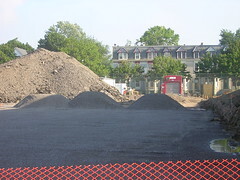 Missing this week is the photo of the mountain of old asphalt that has been ripped from the site! 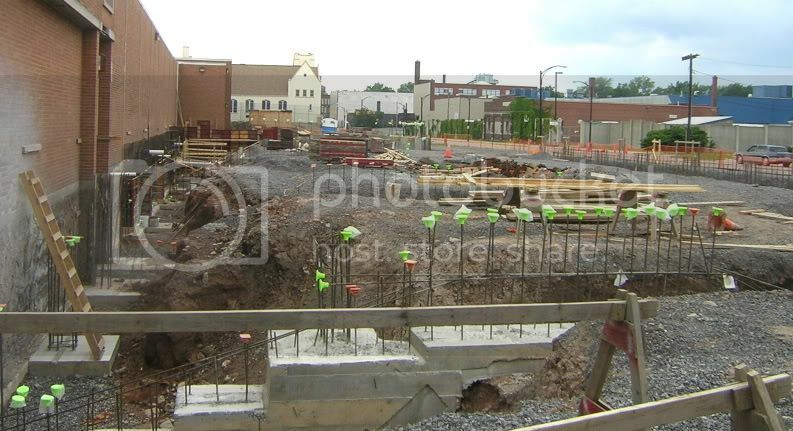 Last week I received the July 2006 update from George Grasser, the über organizer behind Partners for a Livable WNY. This afternoon, I received this latest update. Lots more things of interest to residents of Buffalo, especially information about projected growth and population patterns in southern Ontario. TheProvince of Ontario has released its final 25-year Growth Plan for the Greater Golden Horseshoe area around the western edge of Lake Ontario. The area is projected to accommodate an additional 3.7 million residents by 2031. A five-year $8.3 billion infrastructure plan includes $4.1 billion for public transit. George also sent along his detailed commentary about the Regional Framework that I posted about last week. Read George's remarks, here. Sunday evening I passed by the Ward House again. Seems like the Belmont Shelter crew has now been working over time! 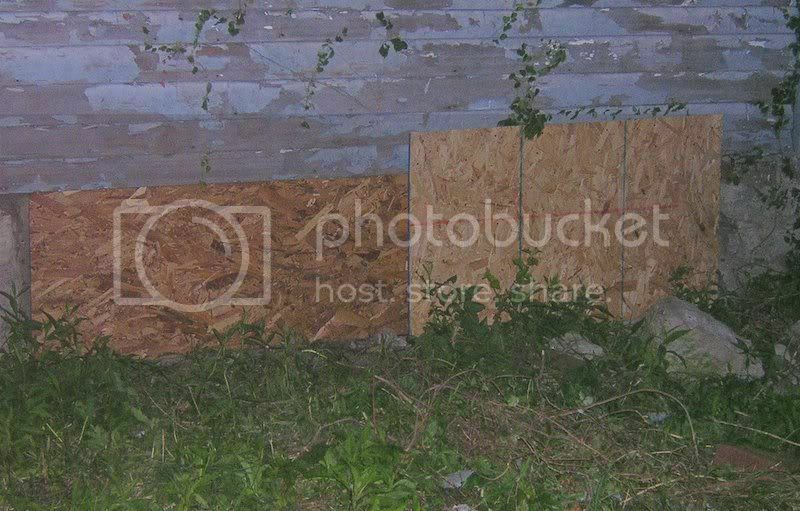 Yesterday's pics clearly show a partial board-up. Today, it's done. Finally after seven months of owning the Ward House, Belmont Shelter secures the property. Sort of crazy with the front steps, don't you think! Now if they would clean up the mess that was dumped on the City owned lot next door! Didn't happen. She came to town! She's in the area for a few weeks, so look forward to some sustained suburban sport criticism in the near future. Transportation to the 'burbs sans auto is nearly impossible and my ghetto cell service drops out just past Transit Rd. Part I - and if you are not from Blogistan...you probably have no idea what this post is about. (You're not missing much...really...) Meanwhile I've noticed some more rather strident suburban righteouness in the ether over the weekend, good for the 'burbs - I guess. Meanwhile, Mr. Snarky from suburbia - who checked the comments section of Part I over 10 times this weekend - begin reading Joel Kotkin to learn more about your neck of the woods. I especially enjoy Joel Kotkin's - Rise of the Ephemeral City, you should, too. 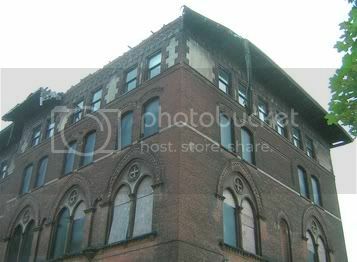 Immediate intervention might save this building from "demolition by neglect." We briefly discussed a "private" Artspace development where local artists could build an equity interest in their own studio. 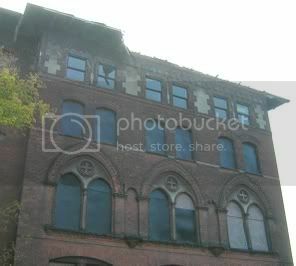 There are 50 classrooms and subdivided the complex might be of interest to an organization that could provide immediate solutions to the falling bricks and collapsing structure. David Steele over at BRO posted this in March about St. Vincent's. I posted this shortly after reading through 50 comments on David's post. I'll put any qualified party in immediate touch with this real estate broker. A very creative real estate attorney I know, could help. I doubt the building will last the winter. Here's the map. 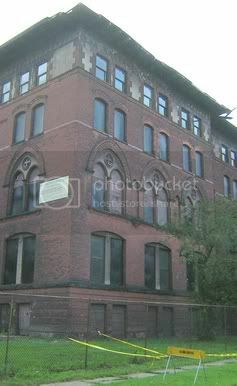 update...Check out the former German Roman Catholic Orphan Home, a few blocks further East. Lots of pics and historical information and guess what? No Housing Court date! 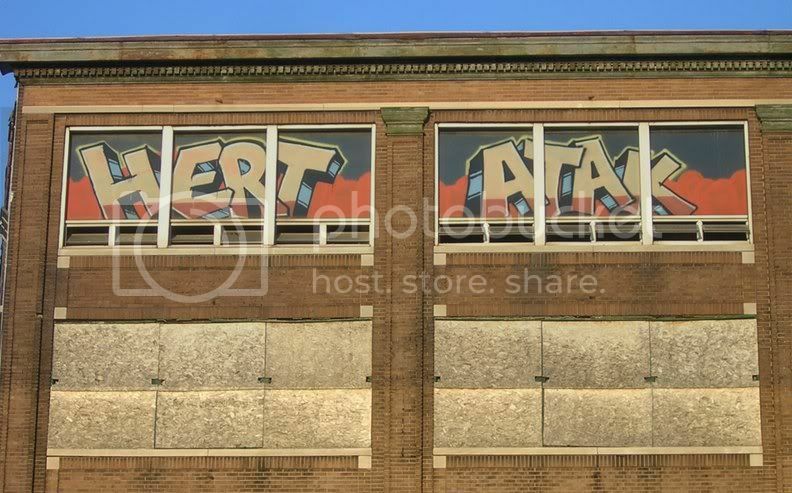 While dining at the Delta Sonic Café with two of Buffalo's most astute obervers of things urban - Chris Hawley and Stevan Stipanovich and enjoying Buffalo's only brick oven pizza recently - we noticed that 'graffiti man' hit the new Artspace building. Heading home from the café I pass by Coe Place on a daily basis. I snapped these pics around 8pm this evening. There was fresh saw dust all over the side walk so I assume at some point during the day Belmont Shelter's crew was securing the Ward House, finally They missed the rear second story windows that have been broken since last Fall. 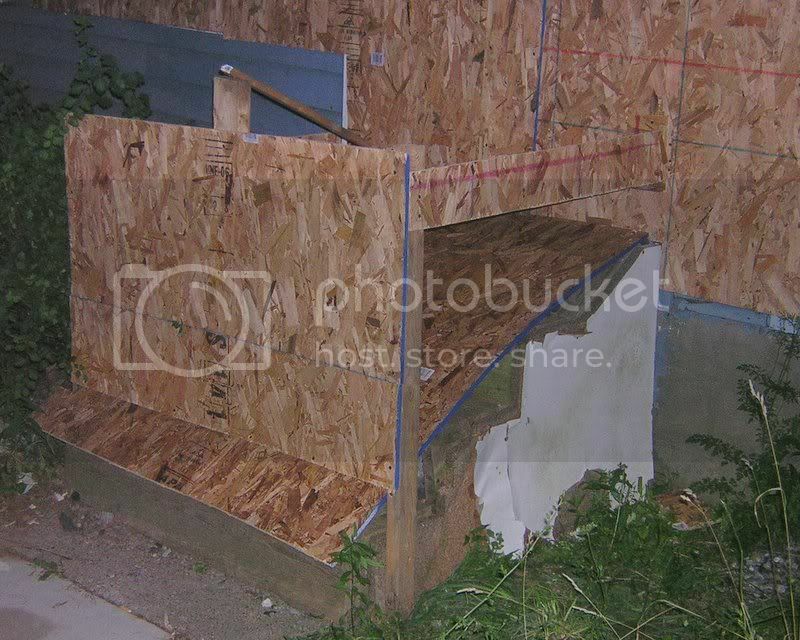 Comparing the pics from two weeks ago, you can see that Belmont Shelter is making slow progress. They missed a basement window and still haven't cleaned up the debris that the guys from Elbers Landscaping dumped on the City owned vacant lot five weeks ago. 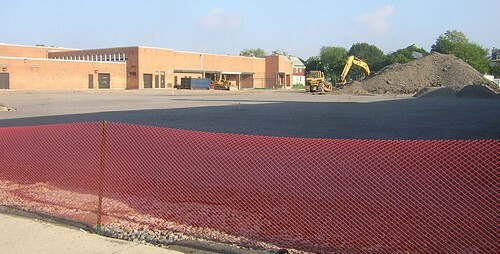 Since phone calls to Belmont don't seem to be working, perhaps a few to Elbers Landscaping will get the mess cleaned up. Belmont hires them to do the grounds of their barracks right next door. Neighbors on Coe saw them dumping on City property after prepping the Ward House yards for demo prior to last month's Preservation Board hearing. I read the update in artvoice on 19 coe. Can you keep me updated? I don't believe belmont in the least - maybe a strongly worded petition needs to go around and be sent to the powers that be. That house is VITAL to that street which now has good things happening. I think he's on to something. If you want on the Coe Place alerts e-list, let me know. On the way to the Post Office, Main & Northampton, Friday afternoon, I noticed the sign on the door indicating that half the post office operations from this building, next door to the new Artspace, have relocated. 14208 services half the area for this facility. One of the letter carriers that I spoke to said that in a few weeks the rest of the facility at on Northampton and Main will be relocating, too. Reason given, the building is now un-safe due to construction activity next door at Artspace. I'll be confirming this with postal officials on Monday morning. Last summer, building owner Mark Pagano - who sold the building next door to Artspace - was literally blindsided by a planned Postal Service relocation from his building. He found out, the day of the public hearing by postal officials who had promised transparency in public relations. For some reason, after numerous public hearings archived here - 14209 Post Office Relocation Archive - the planning process was suddenly stopped. Mark informed me earlier this Spring that he was looking forward to putting HHL on the job of reworking the facade of the Post Office builidng in keeping with Artspace. 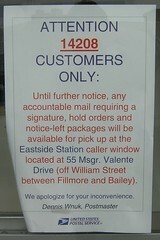 Meanwhile you can take the bus - 4.5 miles away to pick up your packages down at Buffalo's incredibly shrinking main post office just off William Street. Here's the map. Last year postal officials told me that most mail sorting for this end of NYS was moved recently and now takes place in Rochester. According to the nifty NFTA on-line and real time schedule it takes 30 minutes to get to the William Street PO - the 8B and transfer to the 1B during regular business hours. So, check back on Monday, I have a call in to the building's owner and plan to check in with postal officials, too. 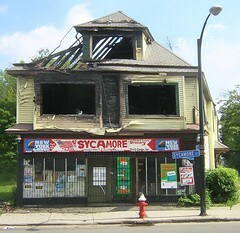 Michele Johnson and Marc Odien have expanded the dialog and discourse here in Buffalo, NY regarding the condition of some of the City's poorest and most neglected neighborhoods. See Flipped, the movie. Aaron Bartley and Eric Walker are carrying the heavy load at PUSH - Buffalo and their story is beginning to get some traction. Earlier this week Marc Sommer from the Buffalo News wrote about the debacle they've uncovered and Geoff Kelly, Artvoice editor has been on it from the beginning. Today Donn Esmonde contributes details about the human side of this municipally sponsored malfaesance. By DONN ESMONDE Delores Powell dreamed of owning a home. I've taken the 1499 properties that JER Services manages and placed them on a "social spread sheet" via Editgrid, a free web 2.0 application. Here's the link. It works like any website. You can view the list, search by street and share it with others. I posted "Nailing Albany" earlier in the week, lots of links. If Michele and Marc were to collaborate with Aaron and Eric the sequel would be, Screwed! In between planning my weekend ventures this evening - pics of abandoned, boarded, derelict and vacant houses in forgotten parts of the City's East Side and grabbing the latest construction pics from Artspace and new demo pics from the Buffalo Forge site - I had a call from a friend - not from Blogistan - inviting me out to the suburbs. I suggested meeting up at a coffee shop, late Saturday afternoon. (At least that's what urban dwellers do.) She's just returned from 15 years away and thought there might be a Starbucks on Transit. I recalled hearing something about an independent coffee shop in Clarence a few years ago and suggested we meet-up there. She'd never heard of the place. I just checked - google blog search results - nothing! Must be a 'sub-urban myth.' Still, I'll check it out earlier in the day on Saturday...and bring an extra set of batteries for the camera. Since the hipster-mobile is in the hospital 'till Monday, I'll have to check the NFTA schedule, too. Just noticed this 2:32 am visit to Fix Buffalo, from Buffalo's City Hall. I thought summer hours ended at 4:00 pm. While trolling through photos tagged with "Buffalo" over at flickr, I noticed this set of "demolition" pics from sayvanderlay's collection. (Some cool HO Oats shots, too.) 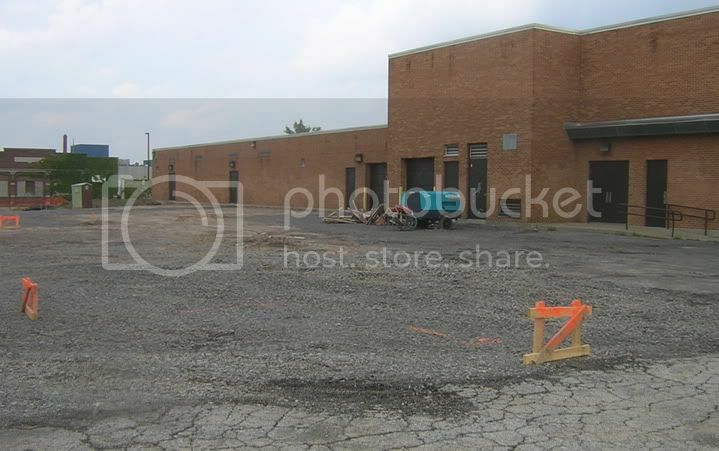 He has a few pics of the demolition going on over at the site of the former Buffalo Forge that is just getting underway. Here's a cool map of the Buffalo Forge site in the block bordered by Mortimer and Spring, Sycamore and Broadway. Great shots of the ever increasingly larger urban prairie, too! 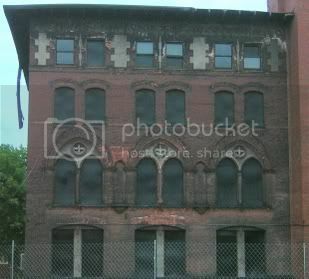 I'll venture over to the site sometime this weekend for some more pics. The Artvoice crew and Mark Sommer from the Buffalo News are doing an extraordinary job keeping JER Services and New York State's own MBBA in the local spotlight. 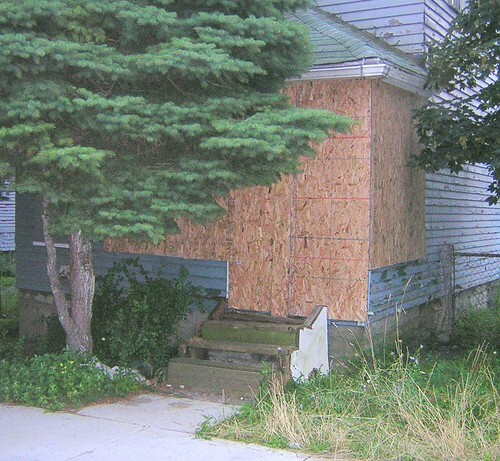 From the latest issue of Artvoice, comes the continuing story of PUSH Buffalo and the damage caused by the City of Buffalo flipping 1500 properties to the MBBA. Make sure to check out Mark's BN article... for additional details. Check out Geoff Kelly's Artvoice cover story earlier this year about the problems confronting inner-city neighborhoods that were created by this scheme. After searching the site for houses in your neighborhood, let me know. Send me the pics and I'll post them here. Great stencil guys! Let's get one made up for Byron! Smart City is a weekly, hour-long public radio talk show that takes an in-depth look at urban life, the people, places, ideas and trendsshaping cities. Host Carol Coletta talks with national andinternational public policy experts, elected officials, economists,business leaders, artists, developers, planners and others for apenetrating discussion of urban issues. Anthony Flint is author of This Land, The Battle Over Sprawl and the Future of America. It's a history of modern development in our nation and a call for a national conversation about how the country should grow. Anthony is a veteran journalist who covered planning, development, and housingfor the Boston Globe for 16 years and was a visiting scholar in 2005 at the Harvard Design School. 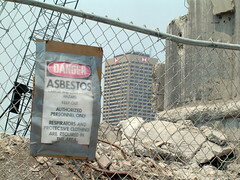 Diana Dillaway explores how development decisions affected one American city, Buffalo, New York. Her new book, Power Failure: Politics, Patronage, and the Economic Future of Buffalo, New York is a chronicle of local misfires, misdirection, and missed opportunities. Diana has worked for more than 25 years in California on urban and economic development. They found, surprisingly, that the blogosphere is only 60% white, and evenly divided among men and women. This probably runs counter to the intuitions of many bloggers, who assume the blogosphere is a white man thing. (An intuition that is supported by Wei’s recent survey of blog commenters, and perhaps demonstrates the limitations of that study.) I suspect that this again is an issue of too much attention being paid to A-listers. In his role as a professor, at the University at Buffalo School of Informatics, I considered Alex to be the dean of the Buffalo blogosphere before he bailed - prior to that ship sinking - and headed to NYC. His post-mortem on UB is worth the read...the comments, too!. While talking with Buffalo News reporter Steve Watson the other day about wireless Internet service here in Buffalo, I mentioned the initiative in Fredericton New Brunswick which is called, Fred-eZone...free wireless blanketing a city one fifth the size of Buffalo, NY. Fredericton was the first Canadian city to go wireless and Toronto will soon be the second. 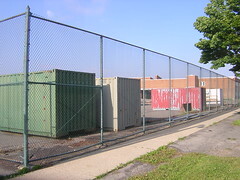 Here's the link for the Toronto Hydro wireless Internet project. The Toronto Wireless Users Group, TorWUG, is worth checking out if you are into these developments. And then there is the The Toronto based Socialtechbrewing Co. They are at the cutting edge of the dialogue about the development and implementation of wireless. Recent articles there include cross-border linkups with American groups. I got interested in wireless while hanging out at the café on Elmwood. 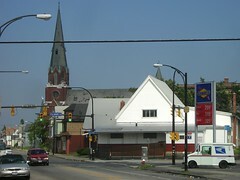 It is one of the few places in Buffalo, that really feels like a City. It actually has a pulse and is always packed with artists and small biz people working on their latest projects. Last year I posted this about wireless in Buffalo and this follow-up in March. Last June I posted this about Intel's Most Unwired Cities Survey. Buffalo ranks...56th! This would help reverse the trend. Make sure to check out Steve's article in today's Buffalo News. btw...if you know of a wi-fi hot spot here in Buffalo, NY - intended or otherwise - and would like to share, let me know...thanks. update...read what Craig has to say about this, Buffalo Unwired. Additional construction and supply trailers arrived on site this week as crews began to ready the foundation work for the another one of the three new additions to PS# 192. Three new addtions are planned - performance, science and a new art wing. The construction sign went up at the corner of Masten and East Ferry, too. 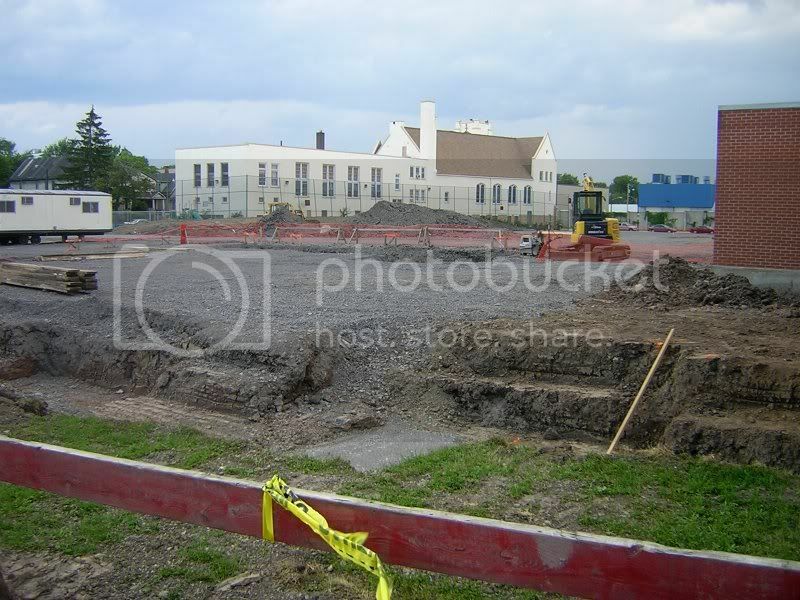 You can see from some of the pics below that the former parking lot is almost gone. 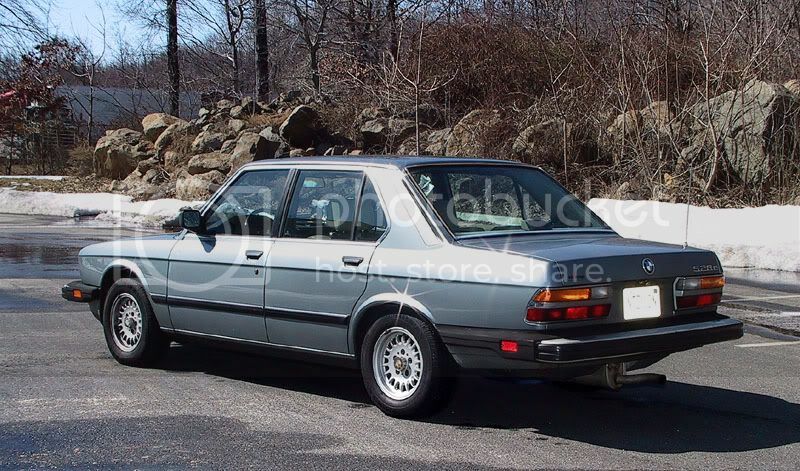 I hope to have interior shots in the next few weeks. Remember completion date is September 2007. Will someone please explain what this planning process has to do with life here in Buffalo, NY. Here's the link - Regional Framework. Any insight FixBuffalo readers can provide is appreciated. 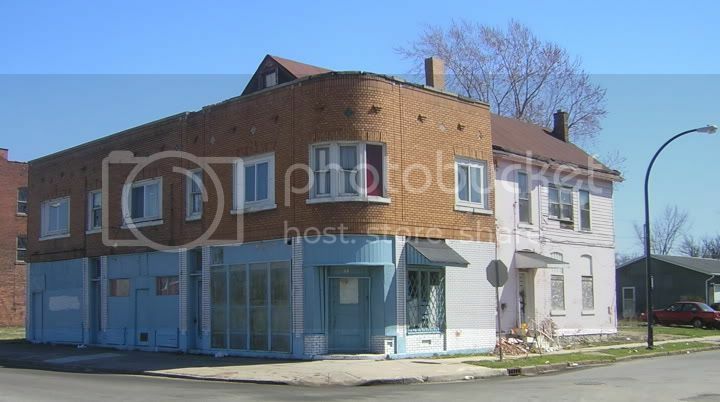 Aside from some general remarks regarding regional population loss, I couldn't find anything substantive regarding issues of local abandonment and vacancy when it comes to commercial and residential property in the City of Buffalo. Check it out and let me know...thanks. 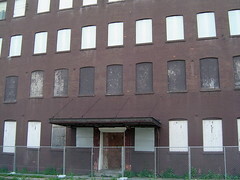 Got an e-mail from George Grasser containing the July 2006 Partners for a Livable WNY report. Lots of good news. George's e-mail also contained a report from a conference he attended recently in Auburn, NY - Unifying the Economic Development and the Environment. Here's that link. Mark your calendar for this event at the Saturn Club taking place in a few weeks. Check out the New Millenium Group website for additional details. Presentation by attorneys Nathan Norris and Chad Emerson from the PlaceMakers organization of Alabama on how the City of Buffalo can adopt a “SmartCode” zoning ordinance. Learn what a form-based zoning code can do to improve land use and the built environment of a city. Many City officials have been invited to attend. The event has been organized by Chuck Banas and Chris Hawley of the New Millenium Group. This program is open to anyone who would like to attend, but you must make reservations by e-mailing Chuck Banas, as space is limited. Visited 830 Sycamore this afternoon (white house on left), the abandoned, boarded, derelict and vacant house where the body of Yvonne Peterson was found Thursday afternoon. Guess what? 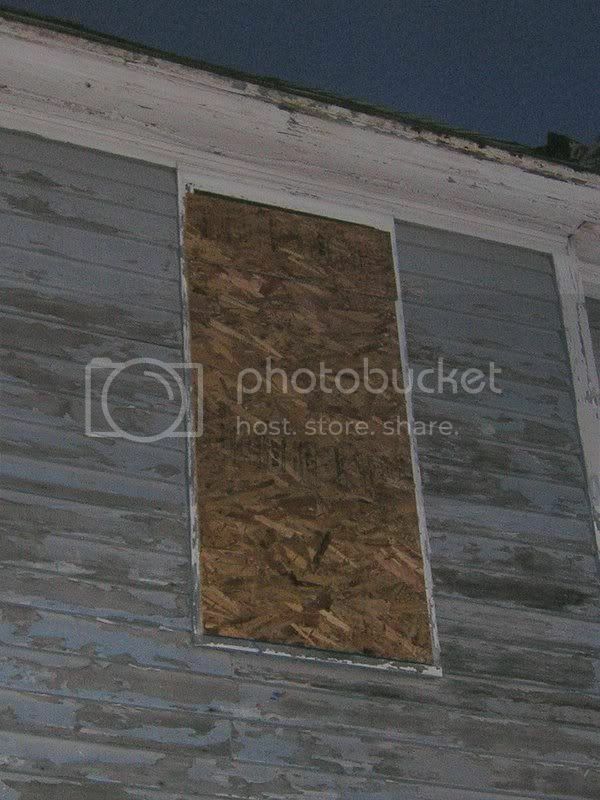 The house is still not boarded! 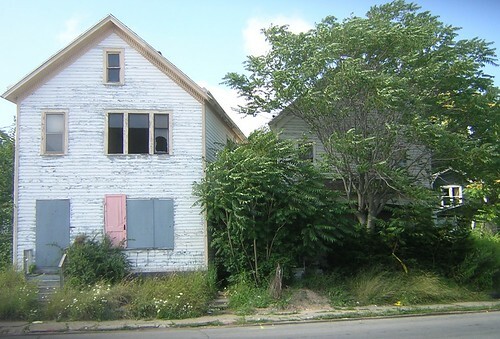 In fact, the two houses next door at 832 and 836 Sycamore are clearly open and not secured. 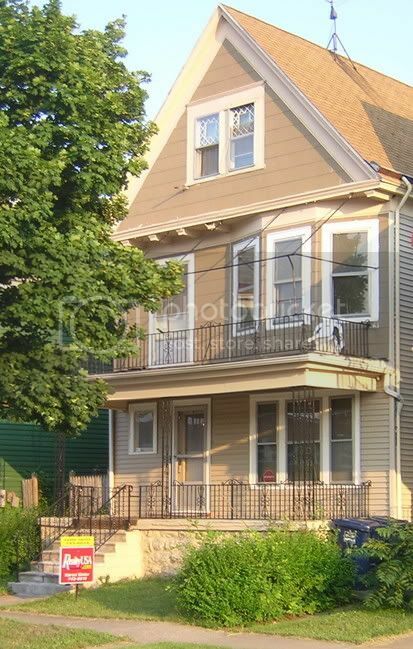 A quick check of City records and it appears as though the City of Buffalo is the responsible party for mowing the lawn and keeping the place up to code at 836 Sycamore the green sided house with the decorative ghetto palm next to the front door. Looking around the immediate vicinity it's hard not to notice that this once prosperous commercial strip on Sycamore Street is now framed by the Transfiguration Church and this burned out convenience store. I had the opportunity to talk with two neighborhood residents about the discovery of Yvonne's body at 830 Sycamore, the house with the pink door where a window once was. They both claimed that her hands were missing fingers and independentily of one another both residents told me that her head was bashed in and that the woman who found the body ran down the street to the Dockery Center screaming something about having just found a body, hanging. Here the various close ups the three houses that comprise Buffalo's Death Row. The first pic shows the narrow garbage strewn passage way between 830 and 832 and the open door where Yvonne presumably entered...minimally I would have expected the three houses to be properly boarded and secured shortly after Yvonne's body was found. But wait...51 Eaton is still wide open today, a full 60 days after Shawn Luchy's partially decomposed body was found in another abandoned house in Buffalo, NY. I wrote this yesterday and this about the first body. 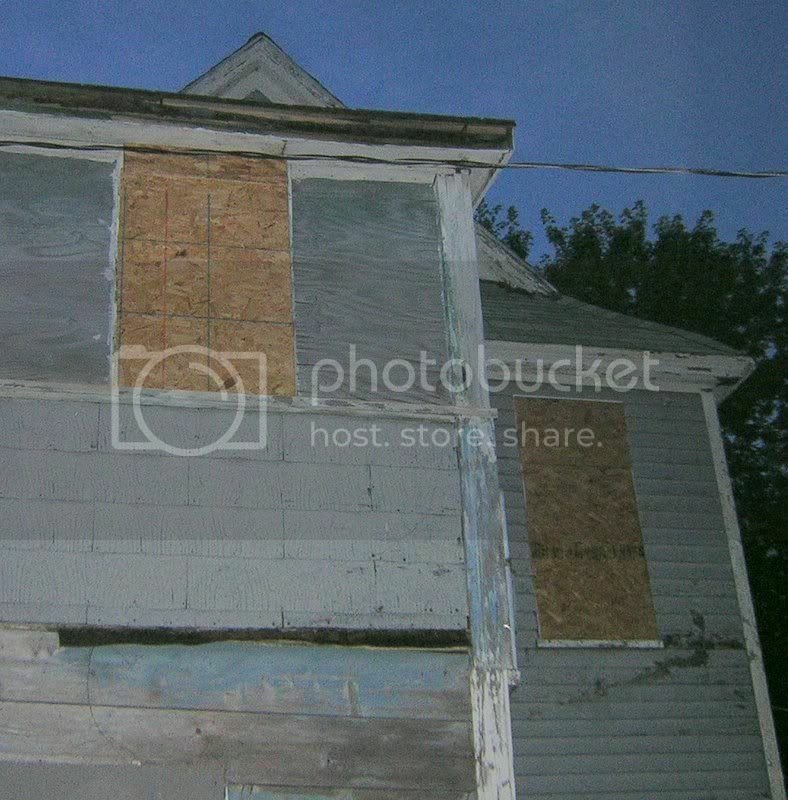 Still wondering how many other bodies are decomposing in Buffalo's abandonded, boarded, derelict and vacant houses?